Any family adventure in the Emerald City should include a visit to Seattle Center, where the Seattle Children’s Museum (*305 Harrison St; thechildrensmuseum.org) captivates curious minds 10 and younger with a slew of engaging exhibits. In the Imagination Studio, kids can build sculptures, paint, and craft with clay. Also at Seattle Center, EMP Museum (*325 Fifth Ave N; empmuseum.org) is a sure bet for older kids. Visitors can peruse the rock ’n’ roll exhibits for inspiration, then head into the Sound Lab for a jam session. Try out electric guitars, drums, and synthesizers. Teens can even download and share the music with friends back home. Grade-schoolers can learn about symphonic music and try out orchestral instruments on Fridays at Seattle Symphony’s Soundbridge (*200 University St; seattlesymphony.org) in downtown Seattle. You might just find your child has a natural talent for the cello or timpani drums. There’s even musical storytime for kids ages 2 to 5 every Friday at 10:30am, when classic stories combine with music, games, and dancing. Explore exhibitions from around the world at the venerable Seattle Art Museum (*1300 First Ave, seattleartmuseum.org), then use what you’ve seen as a springboard to create art together in the museum’s Chase Open Studio. Kids have everything they need to produce a masterpiece: beads, crayons, paper—the sky’s the limit. 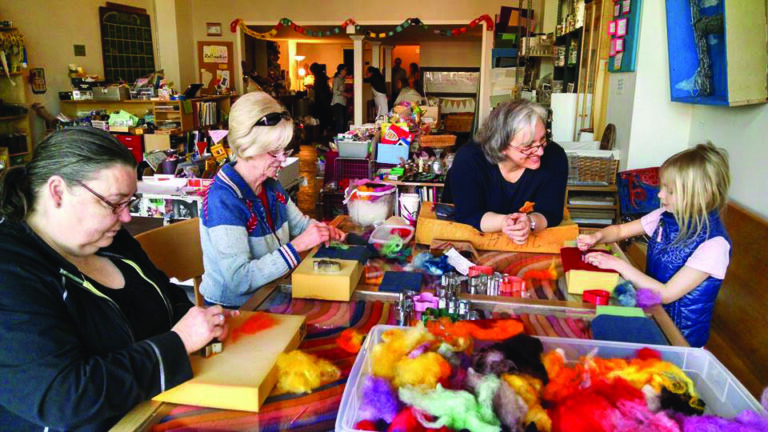 For some eco-friendly art making, head to Seattle ReCreative (8408 Greenwood Ave N; seattlerecreative.org) in Greenwood. This business keeps materials out of landfills and “upcycles” them so kids and adults can unleash their inner artists. Drop in for a Paint Playground session Monday through Saturday, or get your craft on during Friday Crafternoons. Projects vary each week for endless creativity. Voila!